Denny keeps the greater good of the community in mind, especially in Asian American communities. He is dedicated to making sure people are aware of the issues at hand. Not only that, but as a college student and also as a law school student, he made sure his classmates and himself didn’t lose sight of the reason why they were going to school. Denny has just finished his 3rd and final year of law school, and is about to start studying for the bar exam, while also looking for a job. 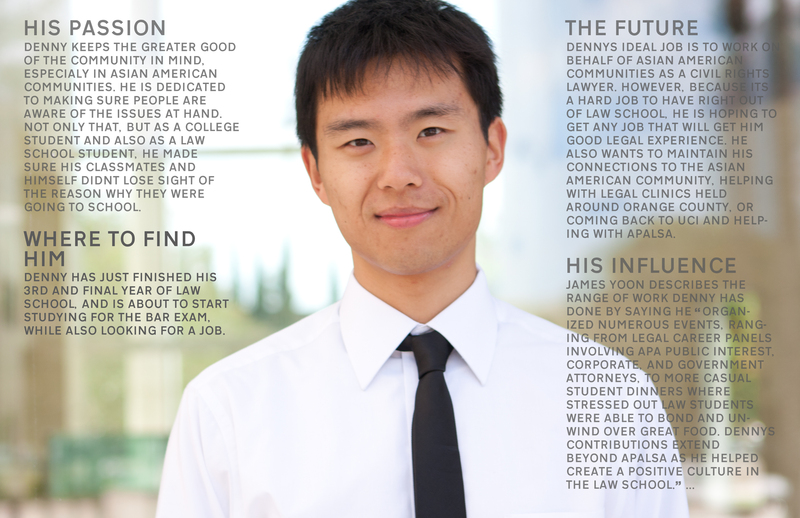 Denny’s ideal job is to work on behalf of Asian American communities as a civil rights lawyer. However, because it is a hard job to have right out of law school, he is hoping to get any job that will get him good legal experience. He also wants to maintain his connections to the Asian American community, helping with legal clinics held around Orange County, or coming back to UCI and helping with APALSA. DC: I was born and raised in Michigan, and my parents are first generation immigrants from China. They operate a family restaurant in my hometown. Growing up in a family of restaurant owners, it’s hard not to be a foodie, and so that shaped my perspective on what was important. Food is important, as well as family. I also grew up in a very Caucasian dominated area of Michigan. Michigan doesn’t have a very large percentage of Asian Americans, but in my hometown, it was basically me and my extended family. That definitely shaped my perspective on race relations and what it meant to be a person of color in a primarily white environment. I went to the University of Michigan for my undergrad degree, and it was a great four years of my life. I spent a lot of time involved in student organizations there, doing a lot of Asian American organizing. When I was there, we had a hate incident happen on campus. Two Asian American students were allegedly urinated on and racial slurs were hurled at them as they were walking down the main street on campus. That got a lot of people upset, and it made people want to do something about that incident. I was one of the students involved in the campus response to that particular unfortunate incident. We also had a big fight on affirmative action, and similar to California’s Proposition 209, we had a proposal too, where voters decided whether the state could use affirmative action in their courtrooms. We did a lot of organizing on that. We also had a lot of tenure related issues, because the administration didn’t necessarily prioritize Asian American studies. At Michigan, we only had a minor in Asian American studies, and we didn’t have a major. Our faculty were generally cross-listed with other departments, so it was hard to retain faculty, and a lot of them didn’t survive the tenure process. It was a really busy four years, but I’m glad I did it, and I wouldn’t have chosen any other place as an undergrad, because there was a lot of organizing and good experience that I gained from it, and it really set me on the path I’m currently on right now. KS: What brought you to UCI for your law degree? DC: Our law school is a brand new law school, and the idea of helping create what at that point was being pitched as the ideal law school of the 21st century sounded really exciting. I knew I didn’t want to do law school in the Midwest anymore, because I did my undergrad for four years in Michigan, and I wanted a change in my environment. I have some friends who I met in college who are from Southern California, and they encouraged me to come. I applied to Irvine, was really surprised when I got in, and so I thought I would give it a chance. I think the idea of helping build a school, where you’re at the table having conversations about what the most effective way of doing law school is, and being part of the students being experimented on sounded like an interesting and challenging opportunity. KS: What did you accomplish as an undergraduate student, and also here at UCI? DC: In the law school, I founded APALSA here at UCI. APALSA stands for Asian Pacific American Law Students Association, and it is the only organization at our school that is focused on issues facing Asian American communities, as well as issues facing Asian American law students. Through APALSA, we put on a symposium, which was called Reigniting Community: Strengthening the APA Identity. It was a one and a half day conference that looked at legal issues facing Asian Pacific Americans. We brought in law professors from all over the country, we collaborated very heavily with the Asian Pacific American Legal Center in LA, and we even had someone Skype in. It was very much a national conversation about the challenges facing our particular community, and what can be done. I think this year is a very timely year to be looking at those sorts of questions, because it is the 30th anniversary of Vincent Chin’s death. It is also an election year, so there are a lot of things that our elected officials and those who are running for office should be talking about. I think one of the biggest things I was able to do here at UCI was start an APALSA chapter and put on the symposium. It wasn’t always easy, so it’s a very proud accomplishment of mine. There are other small things that we’ve done – we petitioned for more Asian American faculty and we are working closely with undergrads. For example, last year we were part of a campaign that tried to do something around the shark fin debate. The California legislature was in the process of approving a ban on shark fin in California restaurants. We were involved with APSA at the time to figure out what a UCI response would be. We also recognize that there are huge pipeline issues. When you go to law school, it’s not out of the ordinary that everyone looks and acts the same way and has the same background. A lot of people already have family members who are lawyers, a lot of them are white or Jewish, and a lot come with class privileges. One of the reasons why there’s a lack of diversity is generally because there are pipeline issues. That is to say, that people of color who want to go to law school don’t necessarily have mentors of color who they can talk to about things like the application process. They often don’t have the economic resources for LSAT preparation. There are barriers for people of color in admission to law schools. One of the things I’ve been involved in is looking at what we can do from an undergrad to graduate student perspective – mentoring students of color to give them the resources and information that we wanted to know when we applied to law school. The law school has a formal mentor program that I’m involved in, and there are also informal ways, like if I meet an undergrad at UCI that’s interested in law school, I try and act as much of a resource as possible. There’s also been a lot of collaboration with the Orange County Asian American Bar Association, as well as the legal center in LA. They run semi-monthly legal clinics in Orange County, generally in areas targeting low income communities all across the county. I try to get other law students involved, particularly because a lot of the people that go to these clinics don’t speak English, don’t speak English well, or aren’t comfortable with talking about potential legal claims in English. It’s really convenient and helpful to have some people who are able to speak some of the language, to at least act as a translator between the lawyer and the client. Law students are busy, but I try hard to get them involved in that program. Generally, for law school, you go to campus for class, and get sucked away for three years, and never do anything. You forget the reasons why you came to law school. One of the things I’ve tried hard to do is provide opportunities for other people who are similarly minded as I am, to remember why they went to law school. 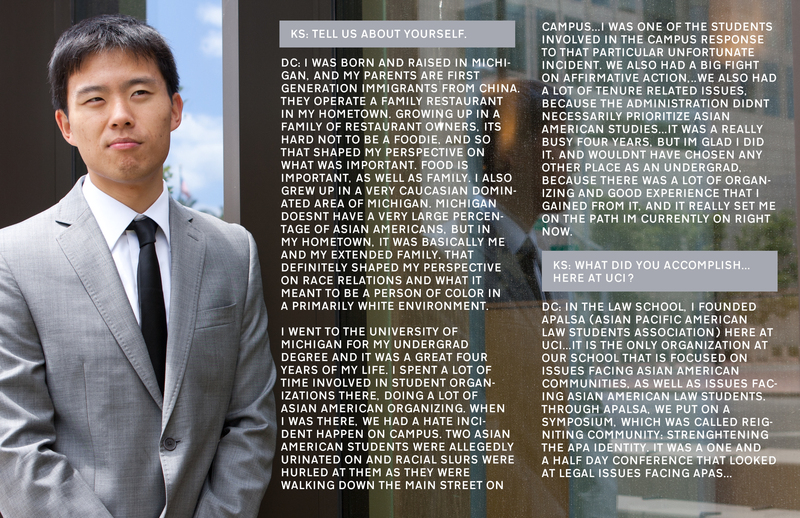 I went to law school because I knew I wanted to serve for the good of the community and wanted to address racial issues as applied to Asian Americans. In providing those opportunities to others, I’ve also been able to provide those opportunities to myself. In college, because that hate incident happened, it was more about community building. That is to say, politicizing other Asian Americans in knowing that we as a community still face issues, that we as a community still face discrimination, and we often don’t feel that way when we go to class, toting our backpacks going to lecture, but that it’s easy to get sucked away in the campus, and forget about broader social issues. I think in my time spent in college I was trying to help people realize that race still matters, and that being Asian American still to some extent does color the way that other people see you, and the way that you negotiate your life with your surroundings. KS: Who or what has been the biggest influence on you? DC: I think a lot about my parents as being people who have influenced me. It’s weird because I don’t think they know that they’ve influenced me so much. They’re lower middle class limited English-proficient Asian Americans. They came here in their late 20s / early 30s, to Michigan of all places, where other than my family, they had no other connections with that area. They gave up the comfort of being in the country they grew up for the past 20 years to come here for my sister and me, so that we could have a better future. They came here with limited resources, and they can only get so much out of it, based on what they can contribute, so they really came for my sister and me. I find that insanely inspiring. They also have shaped my perspective of what is important. Family is always going to be really important for me. I think one of the reasons why I’m interested in Asian American issues is because I grew up in an area where I was the only Asian American. From a very early age, I had to come to terms with what it meant to be the only one. I think that I derive a lot of my inspiration and a lot of my strength and power from seeing what my parents have done, giving up their country and coming here, and not only that, but coming here and struggling. It’s not easy being who they are and where they live, and it’s not easy for me. I remember just two days ago I was in Downtown Disney, and I was crossing the sidewalk, and there was a car that was making a left turn. Pedestrians have the right of way, and he had a stop sign. He did the longest California roll, and didn’t stop, but I kept walking. His window was down, and he said to me, “You know, in this country, we stop for cars.” I don’t know what about it, but in that moment, I thought that this was a highly problematic interaction. He probably assumed a lot based on my physical appearance, about where I’m from and how long I’ve been in this country. And if not, he just didn’t care, and wanted to use my perceived foreignness as a way to humiliate me. In that moment, I was really enraged, first of all that he kept turning, but more importantly, that he would have the audacity to say something like that, in California, in Orange County, and in 2012. So to answer your question, what inspires me is my parents, what they’ve done, and what I’ve seen them go through, but also people who make me really angry. Acts of racism, whether they’re overt or covert, or whether they’re directed at me or at others, make me really upset. 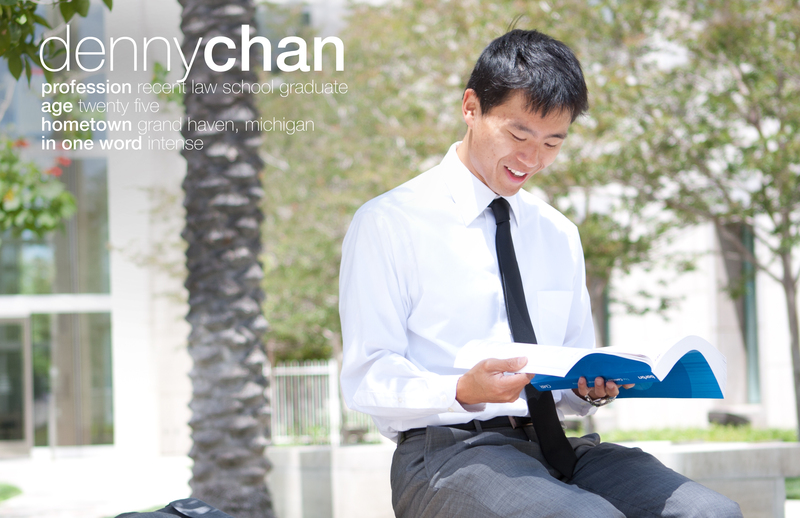 It’s 2012, and particularly here at UCI, the campus is over 50% Asian American. There seems to me that there has to be more of an acceptance of this particular community, and it doesn’t always happen. Those moments make me upset, but also inspire me to do the work that I want to do. KS: Why did you want to pursue law, and what do you ultimately want to see in society? DC: The summer after I graduated college, I interned for APIA Vote. They’re based mostly in DC. It’s a non-profit organization that wants to get Asian Americans more involved in the electoral process, and I was interning for their newly found Michigan chapter. What I encountered in my summer as an intern was a lot of legalese that I felt I needed to be able to be conversant in, in order to help my community. For example, one of my projects was about trying to convince elected officials to offer ballots and election materials in Asian languages in communities where there were large Asian American populations. We ran into a lot of legalese, and a lot of local election clerks who would give all these reasons, talking about different laws, and it was all very confusing. As a fresh undergrad graduate, right out of school, I had no idea what they were saying. I thought that even if I don’t end up practicing law, I want to be able to talk to lawyers in a way that they’re talking. I see a lot of strength in this particular community as a political force, and one way to access that power is through the law. The law can also be used when we face discrimination, or when unjust things happen to us. I think the law is extremely powerful in what we do, and that’s why I went to law school. Unfortunately, coming to law school, I have realized the law is also limited in what it can do, but there’s a lot of merit in being able to talk the way lawyers talk, and being able to access the power of a law degree, to use it to serve a broader purpose. I ultimately want to see more people involved. People don’t care about current events or Asian American issues if it doesn’t directly affect them. I just want more people to care, and be able to see how broader social issues, Asian American issues, and current events, do affect people on a daily basis, just in ways that aren’t as obvious. I think the more people who are involved, the more productive our conversations are. The more democratic they are, the more representative of different viewpoints they are, and ultimately the more good we can do for society. The low Asian American voter turnout is definitely a problem. We already have a population that can’t vote because they are still immigrants and haven’t naturalized. Of the proportion who can vote, not that many register, and not that many go to the ballots. To me that’s a problem that takes community organizing, law, and social networking to effectively combat. KS: If you were stranded on an island, what three items would you take with you? DC: I would take my Macbook, my water bottle, and my digital camera.